Unión Magdalena (Spanish pronunciation: [uˈnjon maɣðaˈlena]) commonly known as El Unión, and nicknamed as El Ciclón Bananero (The Banana Cyclone), is a professional Colombian football club based in Santa Marta, Magdalena, Colombia. Unión Magdalena currently plays in the Categoría Primera A. They play their home games at the Sierra Nevada Stadium. Founded in March 10, 1951 as Deportivo Samarios, the club was re-founded as Unión Magdalena in 19 April 1953. The original playing squad was largely composed of Hungarians who were touring Colombia when their club, the Hungaria FbC Roma, was disbanded. 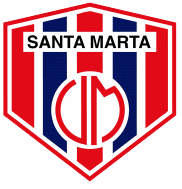 Unión Magdalena was founded as Deportivo Samarios on March 10, 1951. The team was founded with the help of José Eduardo Gnecco Correa and Eduardo Dávila Riascos and was formed by the squad of the Hungaria FbC Roma when it was disbanded after a tour in South America. The first team consisted in 10 Colombians, 8 Hungarians, 2 Yugoslavs, 1 Austrian, 1 Argentine, 1 Italian and 1 Romanian. Deportivo Samarios debuted on league that same year and placed 14th. That season, the team achieved the record of the biggest win in the Colombian league against Universidad, with a score of 12–1. The club was re-founded as Unión Magdalena in 19 April 1953. Unión has only won one championship, in 1968 playing against Deportivo Cali in the final. The first football club of the Caribbean region of Colombia to win a football championship in history. Also being first in the Caribbean Region represented the country in the 1968 Copa Libertadores. Carlos Valderrama, one of the most famous Colombian footballers, started his career here. Relegated in 2005, Unión earned automatic promotion to the 2019 Categoría Primera A season, after playing 13 years in the second division football league. Red and blue stripes compose the traditional shirt of the team, and its design is inspired by Argentine club San Lorenzo de Almagro. flag of the Magdalena department. The club uniform is directly inspired by the colors of the flag of the Magdalena Department since the founding of the team in 1953, although for many years it played with a white uniform. For the 2012 season, his uniform continued with the traditional Barça vertical stripes, and he again used the clothes of the Bogota company FSS with whom he had signed in past seasons. With the change of the shield, the gray color was added to the vertical and horizontal lines, therefore, the averages of the banana set are of such color. ^ Ascencio, Jose Orlando (5 November 1999). "A la tierra del olvido" [Land of oblivion] (in Spanish). El Tiempo. ^ "Unión Magdalena". Dimayor. Retrieved 25 March 2019.